We do not conduct any surveys of the alligator population within Audubon's Francis Beidler Forest. However, anecdotal observations point to a bumper crop of young alligators this year. No guarantee that those youngsters will grow to adults, but insects, frogs, and small fish should remain alert! 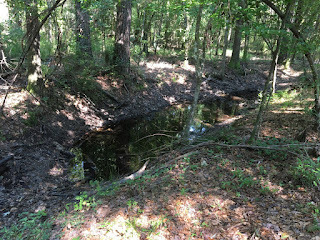 In the image below, four or five of the thirteen young alligators can be seen floating at the surface of the water along an old logging road that was built into the swamp. All were basking on the sunny road prior to our arrival. 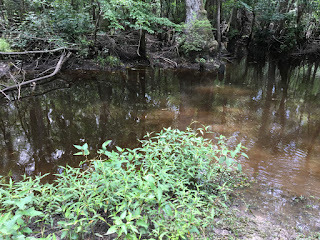 On another day along our canoe trail, a young alligator attempted to hide below the water's surface directly below our canoe. We were touring the property with Carolyn Davis, who was down on an inspection visit from the National Natural Landmark's Gettysburg, Pennsylvania office. As Carolyn was not getting a quality image for her report, we literally offered a helping hand. 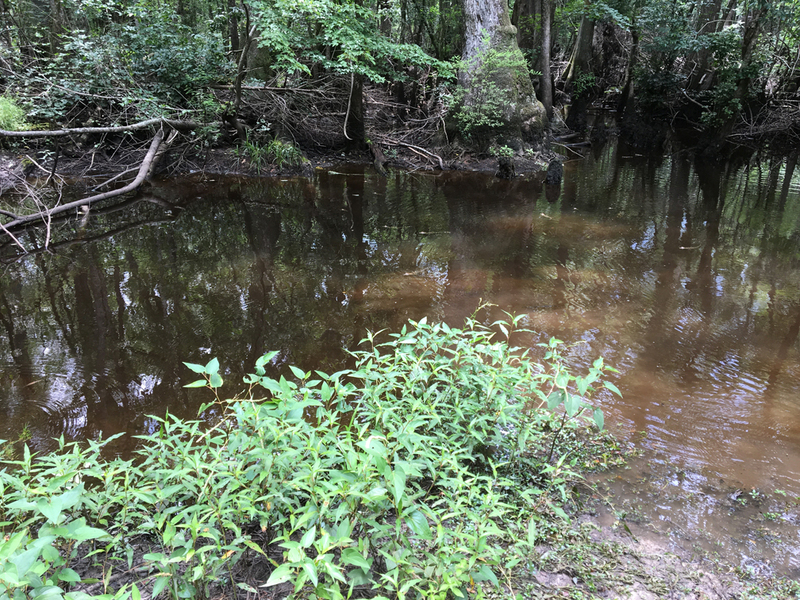 In the 1960s, logging roads built in the swamp were created by "borrowing" soils and piling those soils onto non-target timber logs laid out like railroad ties. 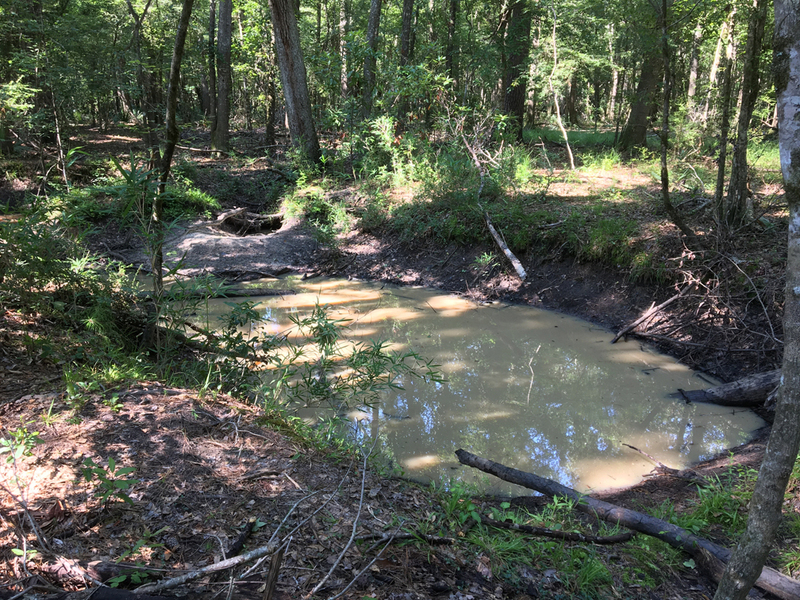 In most areas, the disconnected borrow pits remain alongside the roads, appearing to be ditches, and hold water throughout the year. 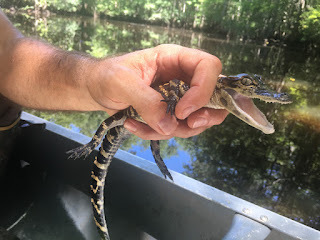 The deeper water offers security for larger alligators, which go to the bottom to wait out any threat, as well as younger alligators, by offering a relatively predator-free environment with a protective mom always lurking within the pool. The image below shows a pit forming a portion of a "ditch" along an old logging road. Note the clarity of the water within the pit. There was likely no large alligator activity within that pit. The image below shows the same pit (right) from the above image and the adjacent pit to the north. Note the lack of clarity in the water in the pit on the left. Prior to the dozen or so young alligators entering the water from their basking areas on the road, a large alligator was heard launching into the murky water. The image below shows the pit containing the adult alligator (somewhere below the water) along with the dozen or so young alligators, some of which can be made out floating near the surface below the cane at the bottom left of the pit. 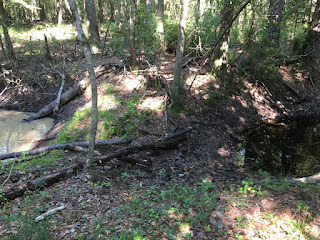 At the far end of the pit, a hole, sometimes called a den, dug into the bank has been exposed by the dropping level of the water. 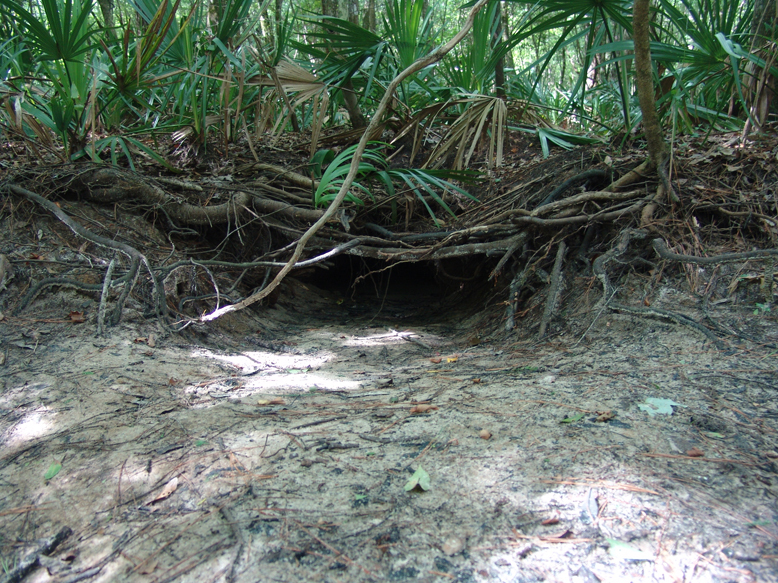 The image below shows a closer look at a den dug into the bank similar to the image above. During the winter, alligators are usually safely below the water. They rise to the surface periodically to breath, but are generally inactive at our latitude. If the temperatures drop below freezing, alligators may retreat into the depths of a den they have dug. 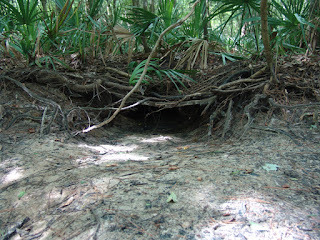 Earlier in the summer, some of the young alligators were observed retreating into the den for safety as we approached. Although alligators in our area are generally inactive in the winter, that does not mean they are never active. On December 16, 2014, an alligator was encountered basking on an old logging road and blocking our path back to the truck. That alligator probably got its start in a nearby borrow pit...maybe even the one it now calls home.